"Asbo" redirects here. For places in Skåne, Sweden, see Åsbo (disambiguation). For the medical skin condition sign, see Asboe-Hansen sign. "Asbos" redirects here. For the village in Iran, see Asbos, Iran. ASBOs were introduced in England, Scotland and Wales through the Crime and Disorder Act 1998. Later legislation strengthened its application: in England and Wales this was largely via the Anti-social Behaviour Act 2003, in Northern Ireland through an Order in Council and in Scotland with the Antisocial and Sexual Behaviour etc. (Scotland) Act 2004. Scotland, however, had a pre-existing tribunal system charged with dealing with children and young persons who offend, the Children's Hearings System. Extension of the Witness Protection Programme in anti-social behaviour cases. More[quantify] courts dealing with cases. More offences including dog-fouling, litter, graffiti, and night-time noise liable for Fixed Penalty Notices. Giving parish councils the power to issue fixed penalty notices for infringements. In the past year around 100,000 cases of anti social behaviour have been dealt with. 2,633 ASBOs and 418 dispersal orders have been issued in the same period. On 25 October 2005, Transport for London announced its intent to apply for a new law giving them the authority to issue orders against repeat fare dodgers, and increased fines. By 31 March 2004, 2,455 ASBOs had been issued in England and Wales. On 30 March 2006, the Home Office announced that 7,356 Anti-Social Behaviour Orders had been given out since 1999 in England and Wales. The 2010 coalition government expressed its intention to replace ASBOs, citing the reasons that "breach rates are high and the number issued has been steadily declining since 2005". In July 2010, new Home Secretary Theresa May announced her intention to reform anti-social behaviour measures for England and Wales with the abolition of ASBOs in due course in favour of alternative "community-based" social control policies. However, in 2012, Liberal Democrat objections prevented the implementation of proposals in a Home Office White Paper to replace the ASBO with a "criminal behaviour order" and a "crime prevention injuction". In May 2013 an Anti-social Behaviour, Crime and Policing Bill was introduced into the House of Commons including a provision to create "Injunctions to Prevent Nuisance and Annoyance", replacing ASBOs in England and Wales. The bill was criticised for the broad and undefined scope of "Nuisance and Annoyance" and defeated in the House of Lords in January 2014. The Anti-Social Behaviour, Crime and Policing Act 2014 received Royal Assent in March 2014. This streamlined the tools available to tackle anti-social behaviour and replaced the ASBO with an injunction (a civil order) and a Criminal Behaviour Order. An ASBO was issued in response to "conduct which caused or was likely to cause harm, harassment, alarm or distress, to one or more persons not of the same household as him or herself and where an ASBO was seen as necessary to protect relevant persons from further anti-social acts by the defendant". In England and Wales they were issued by magistrates' courts, and in Scotland by the sheriff courts. Applications for ASBOs were heard by magistrates sitting in their civil capacity. Although the proceedings were civil, the court had to apply a heightened civil standard of proof. This standard was virtually indistinguishable from the criminal standard. The applicant had to satisfy the court "so that it is sure" that the defendant has acted in an anti-social manner. The test for the court to be "satisfied so that it is sure" was the same direction that a judge gives to a jury in a criminal case heard in the Crown Court, and is also known as satisfying the court "beyond reasonable doubt". Pursuant to section 1(1) Civil Evidence Act 1995, an applicant (and a defendant) had the right to rely on witness statements without calling the makers of those statements – known as hearsay. If a party proposed to rely upon a hearsay statement, then the other party was entitled to ask the court for permission to call that witness for cross-examination. If the court refused to grant such an application, then the defendant would (quite obviously) be unable to cross examine the makers of the hearsay statements. Nevertheless, it was open to them, in accordance with the Civil Evidence Act, to submit that the court should place little or no weight upon material that had not been tested by way of cross examination. in estimating the weight (if any) to be given to hearsay evidence in civil proceedings the court shall have regard to any circumstances from which any inference can reasonably be drawn as to the reliability or otherwise of the evidence. The High Court has emphasised that the use of the words "if any" shows that some hearsay evidence may be given no weight at all. For an ASBO to be made, the applicant had to prove beyond all reasonable doubt that the respondent has behaved in an anti-social manner. The applicant could rely on hearsay evidence. However, the Court of Appeal has stated that it does not expect a court to find that the criminal standard has been reached by relying solely on hearsay evidence. The Civil Evidence Act 1995 itself makes clear that courts should consider what weight, if any at all, attaches to hearsay material. In Cleary, the Court of Appeal again restated that courts should consider attaching no weight at all to such material, in accordance with the words of the statute. It is for the court to decide what weight to give the hearsay evidence. The Court of Appeal has stated that the high standard of proof is difficult to meet if the entirety of the case, or the majority of it, is based upon hearsay evidence. The proper approach would be for a court to consider to what extent the hearsay evidence is, amongst other things, supported by other evidence, the cogency and similarity of supporting instances of hearsay evidence and the cogency and reliability of contradictory evidence supplied by a defendant. Where, for example, ten anonymous witnesses who are unrelated to each other each provide a witness statement as to the defendant's anti-social behaviour where each statement refers independently to the same particular events and where this is supported by a witness statement from a non-anonymous witness, such as a housing officer, who confirms that residents have made complaints about a particular person over a period of time then the court may be justified in according to the statements a fair degree of weight. An Anti-Social Behaviour Order was an order of the Court which told an individual over 10 years old how they must not behave. An Order could contain only negative prohibitions. It could not contain a positive obligation. To obtain an ASBO, a two-stage test had to be satisfied by the applicant authority (see s.1(1) Crime and Disorder Act 1998). The first test was that the defendant had committed acts causing or likely to cause harassment, alarm or distress within six months of the date of issue of the summons. The second test was that an order was necessary to protect persons from further anti-social behaviour. The applicant had to satisfy the court that the individual had acted in an anti-social manner, that is to say, in a manner that caused or was likely to cause harassment, alarm or distress to one or more persons not of the same household as himself. A court could order an ASBO only if such an order was "necessary". Further, each prohibited act would usually be an act preparatory to a criminal offence rather than the offence itself, but not always: Rabess v Commissioner of Police of the Metropolis  EWHC 208 (Admin). In addition, each prohibition itself had to be necessary. It may have been inappropriate for a condition to be not to spray graffiti – the final act as opposed to prohibiting the carrying of a paint-spray can in a particular area, marked on a map. This would only have been necessary if the court was sure that the respondent continually created graffiti with spray-cans in a specific area. An order had to be tailor-made for the individual defendant. The ASBO represented "a form of personalised criminal law". It had to be relevant to their particular anti-social behaviour. Orders should not have been drafted too widely or imprecisely. Each prohibition had to be necessary. An ASBO was very similar to a civil injunction even though the differences are important. First, the injunction was supposed to protect the world at large, in a given geographical area, rather than an individual. Second, breach of an ASBO was a criminal offence to be tried in a criminal court applying the criminal standard of beyond all reasonable doubt. A power of committal to prison was available for breach of a civil injunction but a court was unlikely to exercise that power. A person subject to an anti-social behaviour order where it did not follow a criminal conviction had an automatic right of appeal against both the making of the order and its terms to a higher court. There was also the availability of an appeal to the High Court by way of "case stated". There was no appeal against the variation of orders, and variation was used to add extra conditions and to extend the duration of ASBOs. An application for an ASBO was considered by the courts in its civil jurisdiction and was a civil order. However, breach of an ASBO was a criminal offence and conviction could result in up to five years' imprisonment (two for a minor). Subsequent legislation compelled magistrates to make a Parenting Order where a person under the age of 16 breached their ASBO. Two teenage boys from east Manchester forbidden to wear one golf glove, as it was a symbol of membership of a particular gang. A 13-year-old forbidden to use the word "grass" as a term of abuse in order to threaten people. A 15-year-old forbidden to play football in his street. The first farmer to be given an ASBO was instructed to keep his geese and pigs from damaging his neighbour's property. An 18-year-old ordered not to congregate with three or more other youths. He entered a local youth club that had a good reputation and was arrested because there were more than three youths on the premises. He was intending to attend an event there on how to deal with anti-social behaviour. From their inception, ASBOs were controversial. They were criticised as being "without strong and principled justification", a distraction from the failure of the government's law and order policies, a "recipe for institutionalised vigilantism", and an "emblem of punitive populism". Andrew Rutherford commented that the "ASBO provides a particularly striking example of the criminalisation of social policy". A MORI opinion poll published on 9 June 2005 found that 82% of the British public were in favour of ASBOs; however, only 39% believed they were effective in their current form. A 2012 survey by Angus Reid Public Opinion showed that only eight per cent of Britons believe ASBOs have been successful in curbing anti-social behaviour in the UK. Other parties voiced concerns about the open-ended nature of ASBO penalties – that is, there is little restriction on what a court may impose as the terms of the ASBO, and little restriction on what can be designated as antisocial behaviour. Critics have reported that only around 3% of ASBO applications have been turned down. In July 2007 the Local Government Ombudsman published a report criticising Manchester City Council for serving an ASBO based purely on uncorroborated reports of nuisance by a neighbour, and the Council agreed to pay £2000 in compensation. A 2005 memorandum submitted by the National Association of Probation Officers (NAPO) asserted that "there is ample evidence of the issuing of ASBOs by the courts being inconsistent and almost a geographical lottery. There is great concern that people are being jailed following the breach of an ASBO where the original offence was itself non-imprisonable. There is also evidence that ASBOs have been used where people have mental health problems where treatment would be more appropriate. In NAPO's view the time is right for a fundamental review of the use and appropriateness of Anti-social Behaviour Orders by the Home Office." A survey of Youth Offending Teams by the British Institute for Brain Injured Children in 2005 showed that 38% of ASBOs went to young people with significant mental disorders. Problems included clinical depression, suicidal tendencies, autism, psychosis, personality disorders, learning disabilities, and ADHD, questioning whether young people suffering from these illnesses should be held to a lower standard of behavior than others. By contrast, the same survey of ASBO teams gave only a 5% reported incidence of mental impairment. This massive difference suggests that most ASBO teams did not take into account mental health problems even though the Home Office safeguards for vulnerable people in the ASBO process required it. The inquiry under section 1(1)(b), namely that such an order is necessary to protect persons from further anti-social acts by him, does not involve a standard of proof: it is an exercise of judgment or evaluation. According to government evaluations (e.g. Housing Research Summary No. 230; DfCLG) in the "ASB Intensive Family Support" (Sin Bin) projects introduced to supplement ASBOs, 80% of the families targeted had serious mental/physical health and learning disability problems; one in five families had children affected with Attention Deficit Hyperactivity Disorder, 60% of the families were recognised as victims of ASB. Project managers described many families as "easily scapegoated" in neighbour disputes. HRS 230 called for a review of ASBO policy and investigation procedures to make the whole process fairer. A later study of 53 projects by the National Centre For Social Research noted that 42% of children with mental health problems were reported to have ADHD or hyperactivity, and 29% depression or stress. Amongst adults, 69% had depression. A later comprehensive review of Family Intervention Projects over a decade found little objective evidence for significant, sustained reduction in ASB in the families, and concluded that underlying mental health and disability problems remained largely unaddressed. In the UK, there was criticism that an ASBO was sometimes viewed as a badge of honour by youth. Nacro, the biggest criminal justice-related charity in England and Wales, published two reports: the first claiming that ASBOs were a failure due to being costly and slow to obtain; and the second criticising their use by the courts, saying that they were being used too hastily, before alternatives have been tried. In series 2, episode 3 of the relaunched Doctor Who ("School Reunion"; airdate: 29 April 2006), The Doctor (David Tennant) is surprised the students are well behaved and says, "It's very well behaved, this place. I thought they'd all be happy-slapping hoodies. Happy slapping hoodies with ASBOs. Happy slapping hoodies with ASBOs and ringtones!" In Top Gear series 7, episode 3, the Ford Focus ST hatchback is referred to by presenter Jeremy Clarkson as the "Ford Asbo" as a joking nod to the "urban hoodlum" image of this type of vehicle in the UK. The Stig later pilots an identical vehicle to a 1:34:09 time on a foggy and slippery track, which under normal conditions would have been the fastest hatchback test on record. The "Ford Asbo" name recurs in Rivers of London, in reference to PC Peter Grant's bright orange Ford Focus hatchback, and directly referencing the above Top Gear episode. In Line of Duty series 1, episode 5 (airdate 24 July 2012), Detective Inspector Buckells refers to juvenile criminal Ryan as "the ASBO dodger". In Misfits, the main characters are sometimes referred to as the "ASBO Five" (although one, Curtis Donovan, points out he is not in fact under such an order). In Sherlock, Dr. Watson was given an ASBO in Season 1 Episode 2, "The Blind Banker", after being mistaken for a graffiti artist when the actual graffiti artist fled from two community support officers. In The Smoke, Dennis Severs is nicknamed "Asbo" by his fireman crew because of how he acts, who he hangs out with, and where he lives. In Fish Tank (2009), Mia's mother says she will be sent to boarding schools so she can meet ASBO boys. In 2012, English author Martin Amis published Lionel Asbo: State of England, in which the titular character has changed his name from Lionel Pepperdine to Lionel Asbo by deed poll. In the premiere episode of season 3 of The F Word, Janet Street-Porter issued Charles, Prince of Wales with a "food ASBO" for his Waitrose Duchy Organic products, which she considered comparable to McDonald's in terms of their negative impact on health when eaten regularly. In season 3 of The Inbetweeners Will refers to ASBO when they destroy a garden. In Season 2, Episode 8 of The Grand Tour, Richard Hammond changes James May's rear number plate to 'A5BO'. ^ "ASBOs can't beat a neighborhood policeman Times Online 30 September 2009". Timesonline.co.uk. Retrieved 29 April 2014. ^ a b Gibbon, Sian (13 October 2014). "Anti-social Behaviour, Crime and Policing Act 2014 - All Change?". www.ashfords.co.uk. Ashfords LLP. Archived from the original on 8 December 2015. Retrieved 27 November 2015. ^ "BBC Q&A Anti-social behaviour orders". BBC News. 20 March 2002. Retrieved 29 April 2014. ^ a b "What the Law Says". ABS Help. Retrieved 26 September 2014. ^ "Antisocial Behaviour etc. (Scotland) Act 2004: Guidance on Antisocial Behaviour Orders", Scottish Executive. " "Guidance on Antisocial Behaviour Orders: Antisocial Behaviour etc. (Scotland) Act 2004" (PDF). (333 KB)" URLs. Retrieved 18 June 2007. ^ "Press Briefing: 3.45pm Thursday 28 October 2004 Archived 11 June 2007 at the Wayback Machine", 10 Downing Street. Retrieved 18 June 2006. ^ Plans for £50 fare-dodger fines, BBC News, 25 October 2005. Retrieved 18 June 2006. ^ "Asbo total hits 7,356", The Register, 30 March 2006. Retrieved 18 June 2006. ^ a b "Anti-social Behaviour, Crime and Policing Bill Fact sheet: Replacing the ASBO" (PDF). Home Office. October 2013. Retrieved 9 January 2014. ^ "BBC News 28 July 2010". Bbc.co.uk. 28 July 2010. Retrieved 29 April 2014. ^ Morris, Nigel (23 May 2012). "'Crimbos' replace Asbos – but will they rush children into custody?". The Independent. ^ "Anti-social Behaviour, Crime and Policing Bill". Home Office. Retrieved 9 January 2014. ^ "Anti-social Behaviour, Crime and Policing Bill 2013-14". UK Parliament. Archived from the original on 9 January 2014. Retrieved 10 January 2014. ^ Laura Tanguay; Jean Parkinson (19 July 2013). "Injunction to Prevent Nuisance and Annoyance". Steeles Law Solicitors Ltd. Archived from the original on 28 July 2013. Retrieved 9 January 2013. ^ "Lords reject government's anti-social, crime and policing bill". The Guardian. 9 January 2014. ^ "Crime and Disorder Act 1998 s.1(1)", Office of Public Sector Information. Retrieved 18 June 2006. ^ "Warwickshire Police Media Portal – Images of ASBO and CRASBO Offenders Published On Warwickshire Police Website". Onlinenews.warwickshire.police.uk. Archived from the original on 16 July 2009. Retrieved 29 April 2014. ^ Flint, John; Nixon, Judy (2006). "Governing neighbours: Anti-social behaviour orders and new forms of regulating conduct in the UK". Urban Studies. 43 (5): 939–955. doi:10.1080/00420980600676386. ^ a b c d e f g Home Affairs – Written Evidence: 19. Memorandum submitted by Napo, House of Commons, 22 March 2005. Retrieved 18 June 2006. ^ "B v Chief Constable of Avon & Somerset Constabulary  EWHC 559 (QB)". bailii.org. 5 April 2000. Retrieved 27 November 2015. ^ a b c "Civil Evidence Act 1995". Legislation.gov.uk. Retrieved 29 April 2014. ^ Mack, Jon (2010). "Anti-social Behaviour and Parenting Orders". JPN. 174: 347. ^ Mack, Jon (2011). "Anti-Social Behaviour and Parenting Orders". JPN. 175: 269. ^ Ashworth, Andrew (2004). "Social Control and Antisocial Behaviour: The Subversion of Human Rights". Law Quarterly Review. 120: 263. ^ Burney, Elizabeth (2002). "Talking Tough, Acting Coy". The Howard Journal. 41 (5): 469. ^ Rutherford, Andrew (2000). An Elephant on the Doorstep. Oxford: Hart. p. 56. ^ "Public Concern About ASB And Support For ASBOs", MORI, 10 June 2005. Retrieved 18 June 2006. 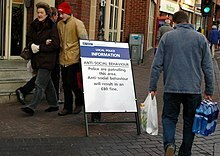 ^ "Britons Remain Unconvinced By Anti-Social Behaviour Orders", Angus Reid Public Opinion, 22 February 2012. Retrieved 31 July 2017 (archived link). ^ "Family Intervention Projects: An Evaluation of Their Design, Setup & Early Outcomes; NCSR, 2008" (PDF). Education.gov.uk. 25 April 2014. Retrieved 29 April 2014. ^ "ASBO Mania". Headliners. Archived from the original on 30 May 2013. Retrieved 6 March 2013. ^ "Failure of policy in tackling anti-social behaviour". Nacro. 12 November 2002. Archived from the original on 28 September 2007. Retrieved 3 January 2007. ^ "ASBOs oversold as the answer to antisocial behaviour". Nacro. 7 December 2006. Archived from the original on 28 September 2007. Retrieved 3 January 2007. Wikimedia Commons has media related to Anti-social behaviour.